Henderson & Ball is a progressive and dynamic law firm based in Kew with a reputation for delivering outstanding legal solutions to its clients across a vast range of practice areas. Having been established in 1885, Henderson & Ball has spent almost 130 years servicing the often complex needs of our client base in time sensitive and cost effective ways. We measure our success by the length of our individual client relationships. Our clients return to us because we meet their expectations in terms of service and result. In some instances we are dealing with fourth generation clients about everything from basic wills and testamentary planning to complicated business structuring, family law, trade marks and commercial litigation. Our clients range from large companies and businesses to families and individuals. We tailor our advice and assistance to meet the needs of our clients, no mater how big or small. Our areas of practice include business and commercial law, property matters including conveyancing, criminal law, wills and testamentary planning, commercial litigation and debt recovery, estate litigation and will disputes, family and de facto law, intellectual property and trademarks, leases, probate and estate administration, promotions law, powers of attorney, property development, trusts and social media. 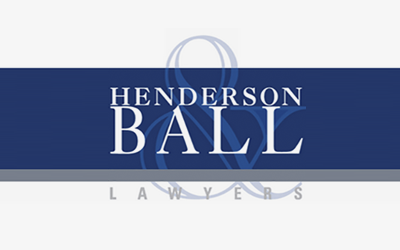 Henderson & Ball – Providing you with outstanding legal service for over 125 years.